Parrots are birds and birds fly. 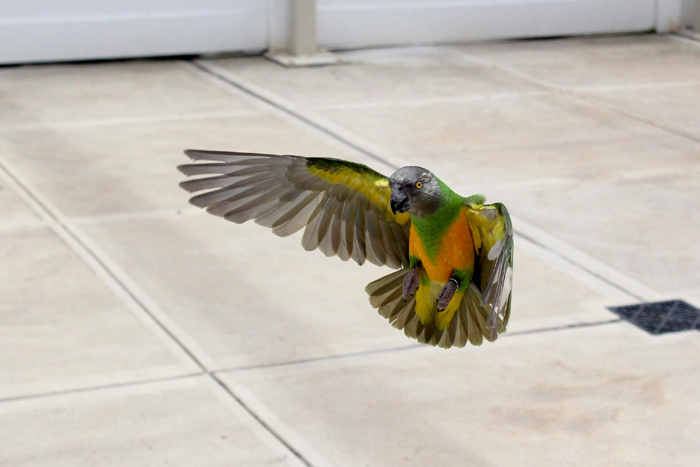 Allowing parrots to fly free in our homes is exhilarating but also poses some challenges. Without going into too much detail about other important things about flight safety (these are covered in my book), I want to focus on the training element. 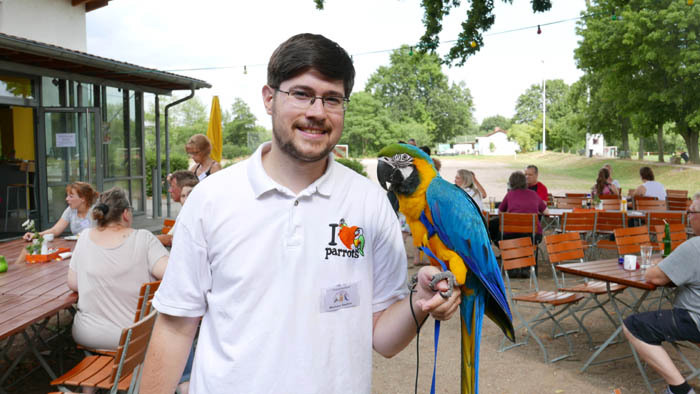 Teaching a parrot to fly to you actually covers two different dilemmas. The first is teaching a parrot to fly controlled within our home at all in the first place and the second is actually about coming to you. What you must realize is that the bird has to actually learn how to fly to you as much as teaching it to want to. 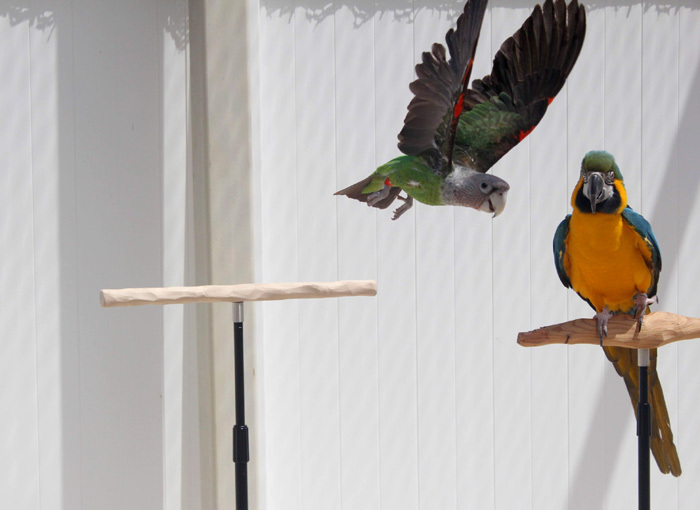 The two best tools for teaching this controlled form of flight are a pair of Training Perches and a target stick. 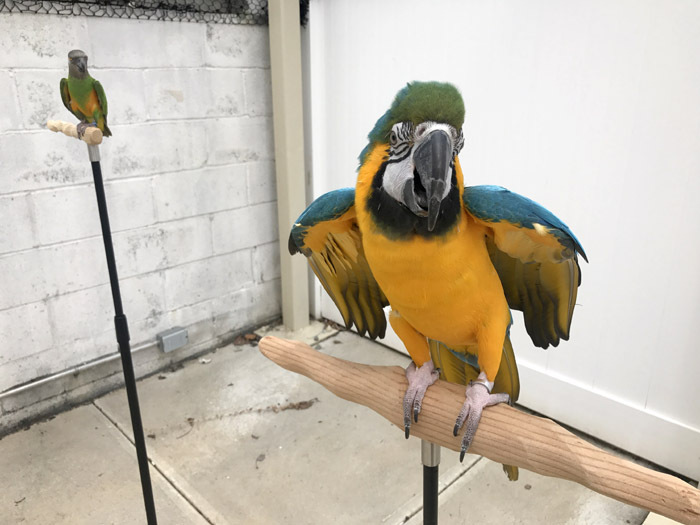 Luckily the Parrot Training Perch Kit I offer includes a clicker and target stick in addition to two perches so you'd be ready to begin the flight training out of the box! If you haven't already done basic clicker and target training with a walking parrot on a perch, go back and do that first. Flying is harder so without understanding what you are asking and a high level of motivation, there is no way the parrot will break ground for just a stick. Begin the flight training process with a reminder of the walking target training. 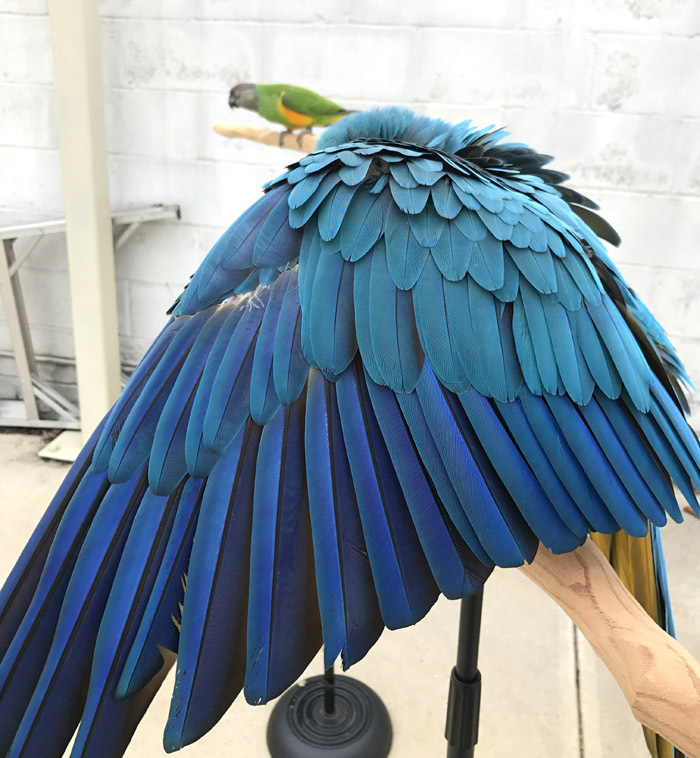 Set up the two training perches in parallel but so close together that the parrot can step and target from one perch to the other. 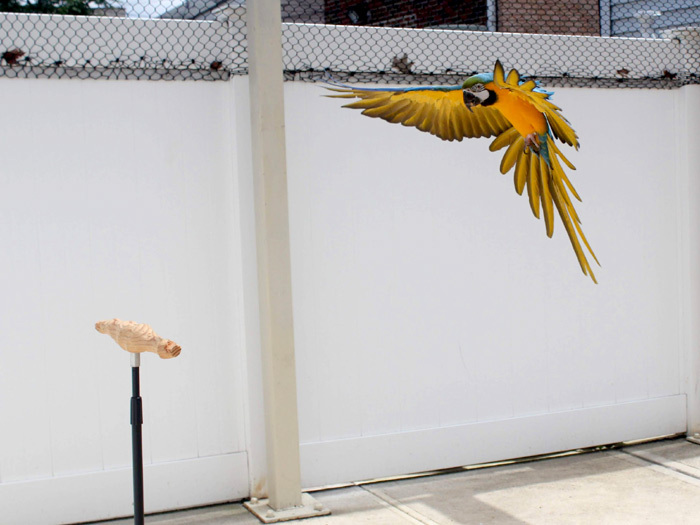 Continue to practice targeting the parrots between the two training perches until you start to build up a rhythm. The parrot will begin to foresee that you will target one way and the other and maybe even jump the gun a little and go before targeted. This isn't really what we are after but it will show good motivation to continue. Begin to spread the gap between the two training perches ever so slightly. Continue targeting the parrot between the perches without letting it realize that the gap grows after subsequent targeting attempts. Eventually the gap will be big enough that the bird will have to jump or fly to get across. Hopefully the bird is a capable enough of a flyer to be able to realize to do this on its own. If it does not, you may need to trick the timid bird that won't fly into walking across but then spreading the gap enroute to cause the first flight to happen. A way to do this is to set the two training perches just slightly too far apart to walk. Then tip the remote perch toward the bird and target for it to walk. Just as the bird reaches the gap, return the distant perch to its original position. This will cause the bird to flap reflexively to catch its balance and make it across the gap. With sufficient rewards and motivation, after a few such attempts, the bird will begin to make the effort to fly across. Progress will be slow at first but then pick up. At first the bird does not know what you want but also doesn't know how to control itself to make such a flight. Furthermore, the flight muscles may be atrophied or inadequately exercised. It will take time for the bird to regain the strength and motor skills before progress can be made. Continue spreading the gap between the two training perches and target the bird to fly bigger distances. The bird will develop skills and strength after a few days of these exercises. 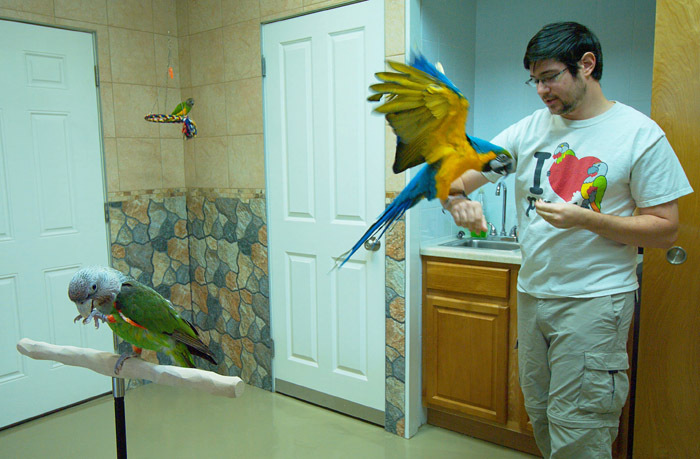 Adjust the height of the training perches to teach the parrot to fly up and down as well. Eventually replace the second training perch with your hand or arm. Phase out the target stick but continue giving treats for successful flight recalls. Instead of targeting, you can call your bird's name as a command to fly to you. Keep increasing the distance and challenging your bird and you will develop an excellent and reliable flight recall. Keep in mind that very high levels of training motivation are required for flight training. You can use a combination of food management, trick training, and other techniques to achieve it. This is covered in great detail in my book, The Parrot Wizard's Guide to Well-Behaved Parrots. 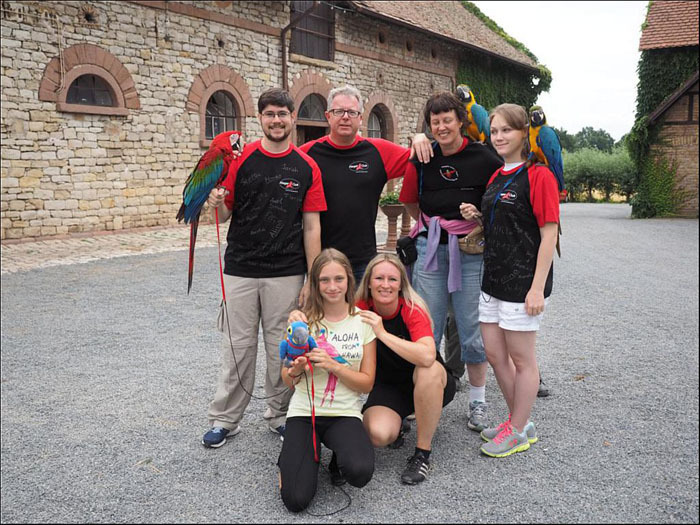 Now get a Parrot Training Perch Kit and follow these steps and you will be on your way to flight recall training your parrot. More videos and information about this flight training method are available on the Training Perch site. 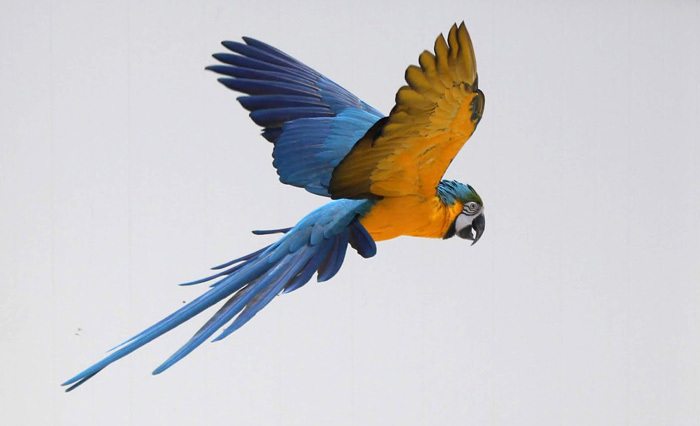 Now here's a video of Marianna following these same steps right out of my book with her Blue and Gold Macaw, Rachel.